The first phase of a £1.3 million park development has been completed on the former Cannock Stadium site at Pye Green Road, Cannock. Funded by Cannock Chase District Council, the park will be a fantastic open space for the public to enjoy. The development boasts a variety of exciting features, such as an adventure play area, BMX track, outdoor gym, cycleways and a community allotment. Blakedown Sport & Play Ltd was selected as main contractor for this project to carry out the works. 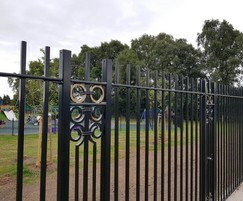 The existing decorative wrought iron railings were dilapidated and the poor condition of the railings meant that they were unsafe and needed to be replaced with new ones to provide a formal, decorative and secure entrance feature to the newly opened park. Having worked with Alpha Rail on numerous projects over the last 25 years and always being satisfied, Blakedown appointed Alpha Rail to complete the design and then manufacture new railings that matched the ones previously installed. 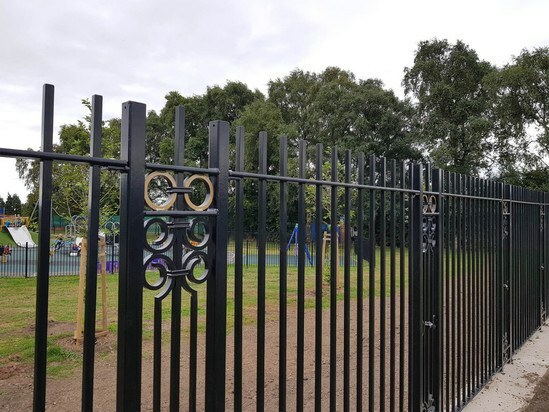 In total, Alpha Rail supplied 71 linear metres of 1.8m-high decorative vertical bar railings along with a 5.5m-wide gate to the park entrance. The railings made to match the previous ones were manufactured alongside a double-leaf gate which contained large laser-profiled letters spelling out ‘The Stadium’ and will act as the face of the new park. Decorative scrolls are featured within the metalwork, which were hand-painted gold in order to add to the prestigious appearance and highlight the intricate design. 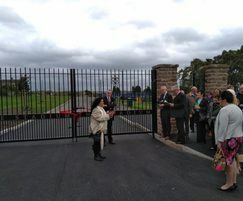 Wednesday, September 19 saw the official opening of the park, where the council leader was joined by members of the community to cut the ribbon and celebrate the opening of the new space.